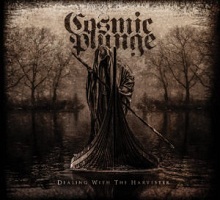 COSMIC PLUNGE are back with their second album, five years after the release of ‘’Wanderers on the Face of Earth’’. They have been at it since May of 2010 and this is only their second release. They are part of the ever growing Greek Doom Metal scene back in Heraklion. It’s a scene that has been blooming the last decade or so. Greece has given us some very good bands in so many different genres throughout the last 30 odd years and the Doom Metal scene is a bit newer. Newer doesn’t necessarily mean original nonetheless. This album left a lasting impression on me but not in the best way possible unfortunately. Look, I have only followed the Doom Metal scene the last few years or so, I have a lot of backlog of bands I need to listen. Everybody everywhere has suggestions on bands in the genre, you have to listen to this…don’t forget to listen to this…and so on and so forth. The scene is overflowing with bands that obey to this particular repertoire of music. I am a huge BLACK SABBATH fan since my very young days and you have a plethora of bands that followed in their footsteps but not everything is good out there. Bands like ORCHID, PALLBEARER, YOB are the pillars of the genre and are the measuring stick of bands in the genre. Bands that sound old school but they add their own little twist and make it their own. I may say that reinventing the wheel is not important for me but in a genre that has a lot of stale acts, you have to get out there and distance yourself from the other bands. Unfortunately, COSMIC PLUNGE fall in the complacent category. It’s an enjoyable album, but nothing really stands out except bad production values. The vocalist is way too loud compared to the rest of the album, they mixed the vocals with the music and it doesn’t jive at all. I know sometimes Doom Metal bands like the minimal approach as for production but I felt this hurt the overall value of the album itself. If it was a bit more well-produced, maybe I would have graded the album a bit more but it really hurt the overall feeling of the album. The vocalist does a fine job, his tone, his presence just fits really well with the music. I felt it was a nice match but overall, the music is the same as hundreds of bands out there, there is nothing original. It was underwhelming to say the least.